studio PIKAPLUS have designed this small two bedroom house surrounded by a forest in Slovenia, that has an exterior of black metal siding and a softer light wood interior. Inside the home, black furniture and design elements contrast the light wood interior, like in the living room and the stairs. Glass doors open the living room to the deck outside. Opposite the living room is the dining room, also with doors to the outside. Windows that follow the shape of the house allow natural light to flood the space. White bench seating along the wall has been included on one side of the dining table to save space. Next to the dining room is the kitchen. It has a u-shaped layout with white hard-ware free cabinets, a wood countertop and open shelves that float on the wall. Black elements, like the fridges and sink and artwork, are also featured. Also on the main level is the only bathroom in the home, that has a black shower and flooring, as well as a light wood vanity. 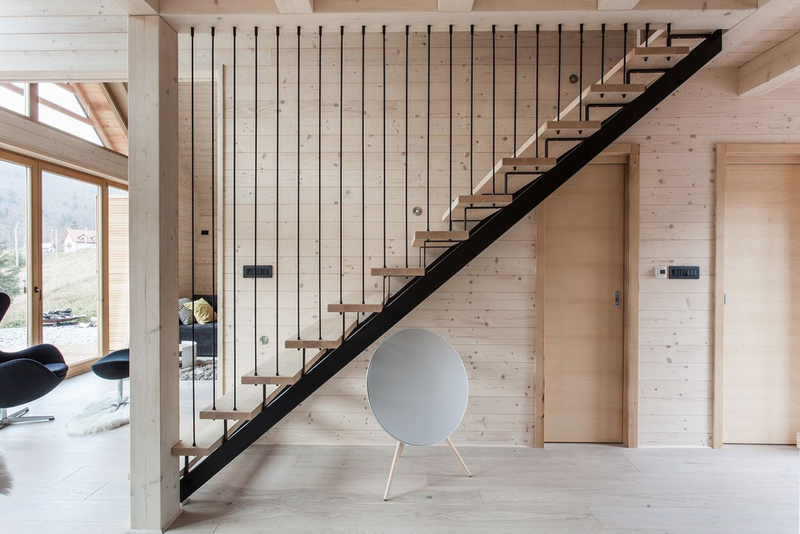 Black steel and wood stairs lead to the upper floor of the home. Upstairs, the master bedroom has a sloped ceiling, matching the line of the house. On one side of the bed there’s a glass railing that overlooks the living room, and on the other side of the bed, there’s a wall of built-in storage. Opposite the master bedroom is the children’s bedroom. Custom bunk beds perfectly fit into the space, and if friends stay over, there’s a pull out bed too. Another glass railing allows the bedroom to overlook the dining room below.